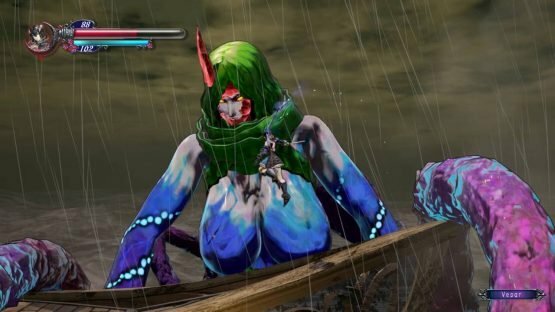 Kickstarter projects are often a mixed bag, running the gamut from genius future gems to mismanaged disasters, so it was with more than a little trepidation that I sat down at EGX Rezzed for our Bloodstained: Ritual of the Night preview. For context, I’m personally a large fan of Castlevania titles, especially those released between Symphony of the Night and Order of Ecclesia, and so the news that Koji Igarashi was working on a new title in the same vein was always going to make me insufferable to everyone around me, and I’ve definitely risen to that challenge of being a general annoyance. To get this out of the way first, this is VERY much a spiritual Castlevania title. 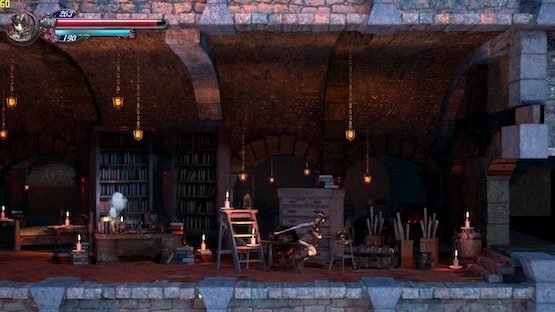 But, instead of it taking the lion’s share of its prompts from Symphony of the Night, it looks to Soma Cruz or Shanoa’s adventures for most of its inspiration. As such, the player has a large amount of weapons at their disposal and can acquire the abilities of the enemies in random drops of Shards. These Shards will give you an ability related to the enemy in question that can be drawn upon using MP. The weapon variety, even in the short demo I played was incredible, allowing the player to utilise means suited to their play style whether that is keeping your distance with the firearms or getting brutal up close with the axes (I personally loved the katana). All the traditional 2D ‘Vania trimmings are present, with a map design that could very easily be from the DS titles of the franchise, red save rooms for moments of reprieve and beautifully designed fast travel rooms with room-filling stained-glass windows in the background. And yes, you can break pretty much all of the light fixtures. The gameplay from moment-to-moment is solid, with each weapon having it’s own core move set and then combat feeling fully fleshed out by the Shard abilities. 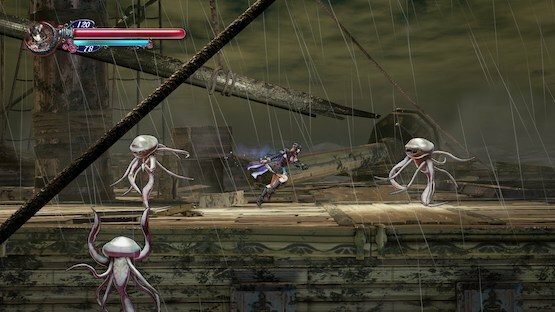 Also, the jumping doesn’t feel too floaty, which thankfully stops the Miriam from feeling out of the players control like the protagonists tended to in some of the ‘Vania titles. As a final early gameplay feature, there is a crafting system that allows you to exchange the various resources that you can pick up from enemies, by breaking items, or opening chests for new weapons, armour and accessories for Miriam to use. The only real complaint I have from my time playing the game is that the game itself feels remarkably slow to play. This is especially noticeable during moments with more complex backgrounds, like the entrance to the castle at the beginning. However, I spoke to the 505 Games themselves, and they assured me that the movement options open up throughout the game to allow the players to traverse the world quicker, like powered charges and laser-focused dashes, along with the fast travel rooms. Also, interesting, they said that the movement speed in the game was actually modelled on that of Symphony of the Night, and that it might be more of a case that the game only appears slower because of the 2.5D effects on the settings, which explains my issues with the scrolling castle entrance. You might have noticed that I haven’t really mentioned the story here, and that’s because I don’t know it. I skipped all of the cutscenes in order to get into the game quicker, but i can confirm that these scenes play out much like you would expect, with text-based exchanges between characters. What I do know is that initial stage of the demo was set on an impossibly big boat, before boat befalls an unfortunate monster problem and crashes into a town with, you guessed it, a castle. There definitely was a more robust story here though, with regular events that I resolutely skipped. Visually, Bloodstained: Ritual of the Night is much improved on the last time I saw it, looking much crisper and more impressive. 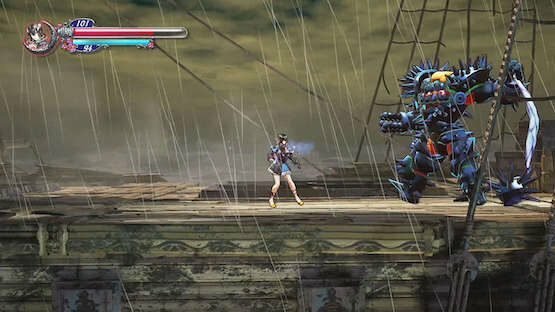 The locations a colourful but still fit quite well within the darker tone in the game, and the character animations (especially for Miriam) look great. I also have to take time to talk about the music, which is absolutely fantastic. It perfectly matches the feel of the game, and ties it quite closely to its more famous siblings, whilst still sounding utterly unique. Michiru Yamane has done great work here. Overall, Bloodstained: Ritual of the Night is shaping up to be a fantastic title, and one that should be a definite purchase for anyone that is missing the Castlevania series in it’s absence. There might be a lot of Metroidvania titles out there right now but, even at this early stage, this game deserves your attention. 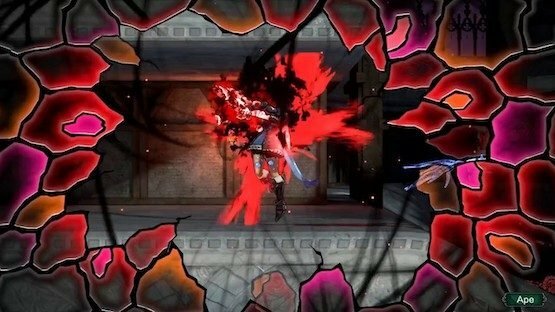 Bloodstained: Ritual of the Night is due this year for Playstation 4, Xbox One, Nintendo Switch, and Windows PC.